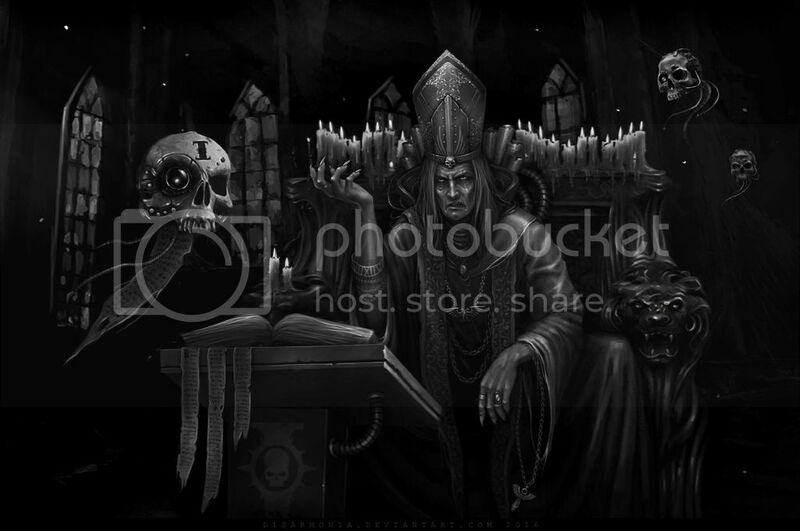 So following from the discussion in my other thread, I went looking at various artwork on google and was seriously impressed by some of the concepts I found for various Ecclesiarchy characters. As a result I've decided to do an entire group of characters not just one . I'll want him to look quite old and venerable, but also to make him look proud and inspiring, as such I don't think I'll use any sort of face mask. He'll have some sort of shrine on his back and I intend to try and make him look like he's on some sort of life support system. 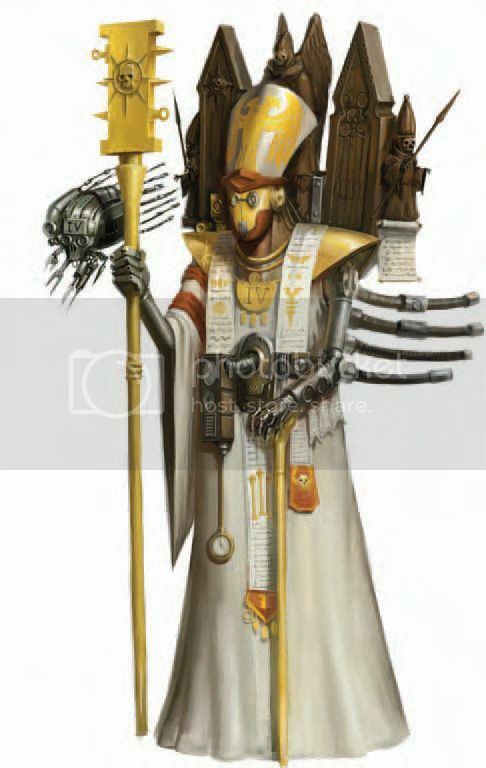 He'll be essentially unarmed, but I intend to include several servo skulls for protection, as can be seen in several of the Ecclesiarchy images. A cherub may be also be included. I particularly like the first of those images, although it will be quite a busy model with all the books and pouches. 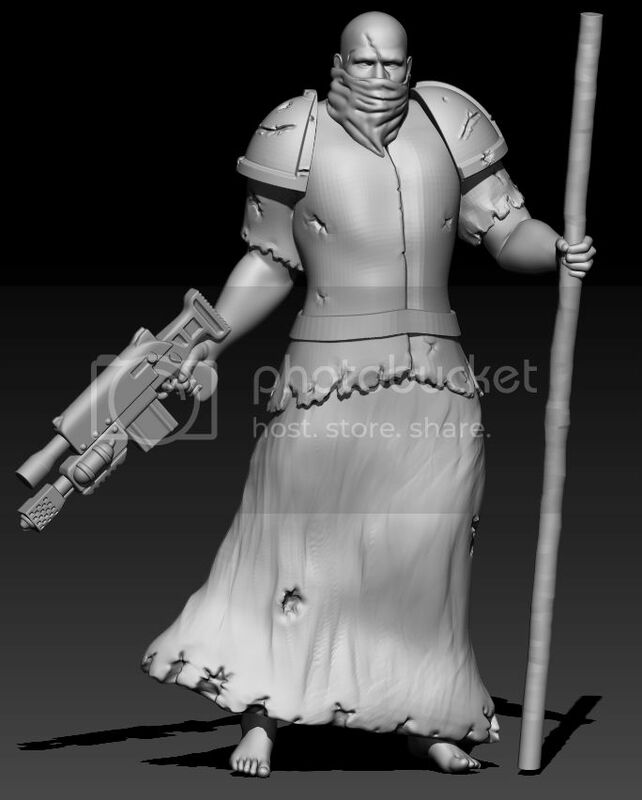 I'm also planning on sculpting an Adeptus Sororitas bodyguard although whether she'll be in full power armour or not is undecided (I'm leaning towards not at the moment, I feel that the power armour would be reserved for battlefield duties). We'll see how things go. This project might be a bit too ambitious! These are all fantastic inspirations and starting points. 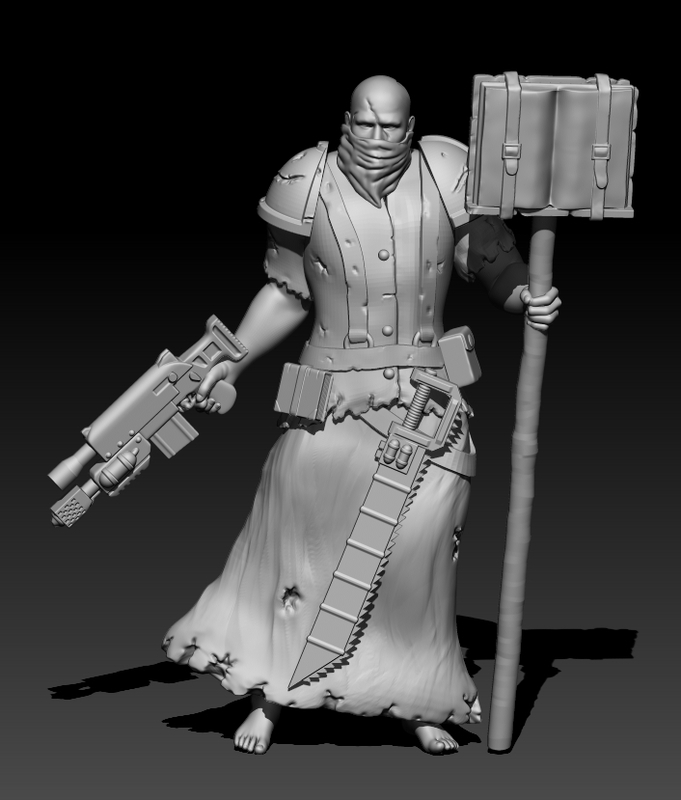 And I'm always enthused to see more female options entering the mix of 54mm Imperial options. The first one........... If futurama did a robot priest...... it'd look like that. I say do that one. 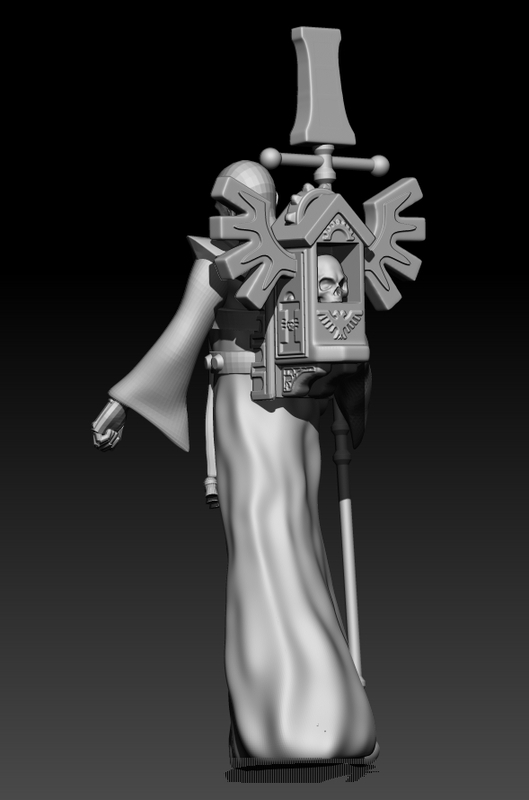 Now to add all the grim darkiness - robotic bits, life support systems and a ridiculous shrine on his back! He's a long way from finished yet and will be acquiring a mitre and other ecclesiarchical trappings. He would make a good base for a psychic character though so I'll try and make things as optional as possible and include a plain hatless head. Very nice details - is he wearing fingerless gloves? It's an unfinished bionic hand, which clearly needs more greebling . Took a break from the Cardinal today and decided to design one of the weapons for the Missionary Hero. I'm going to do a variety of versions including plasma, melta, grenade launcher, sickle mag and just plain straight mag versions. I should also be able to to use it as the base for a Bolt Pistol (with a fair amount of chopping it down!). 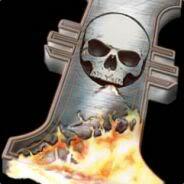 I may do a belt fed and drum mag version too. Edit: not 100% happy with the design of the stock, looking at it now. May need a rethink. I've also been working on the shrine for his back and I still need to do a cane for his left hand. What I'm not sure about is whether to do a Mitre or not? I quite like it with just the bald head. 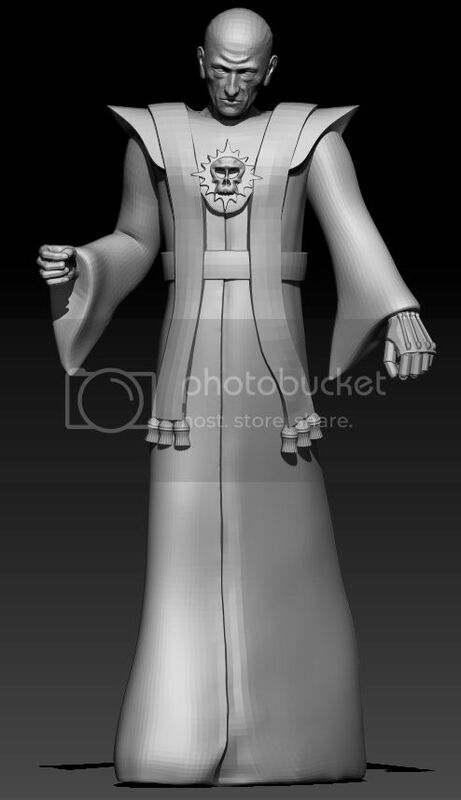 He also needs some kind of belt buckle design and buttons for his cassock. 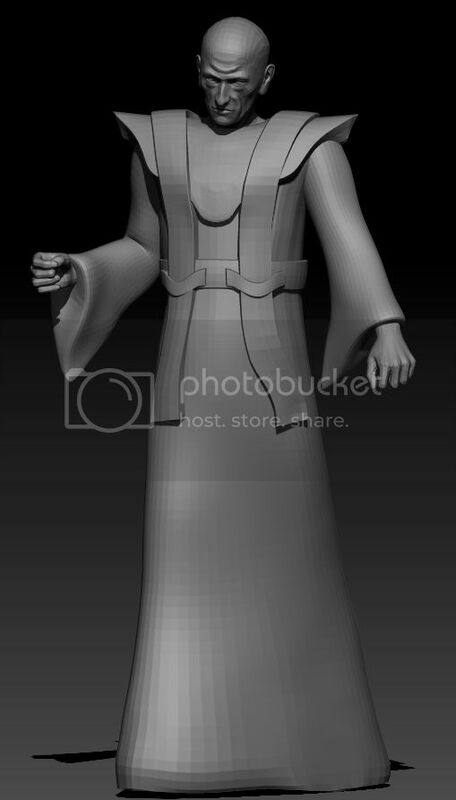 I don't think I'm going to add any other details as I'm liking the clean look of the model. 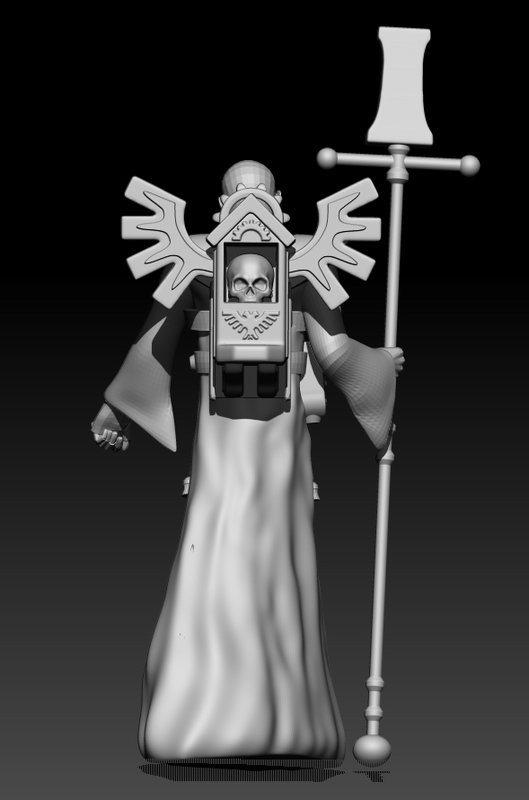 Not quite finished the Cardinal, but I've been working on the Missionary for a bit. Looking good mate. 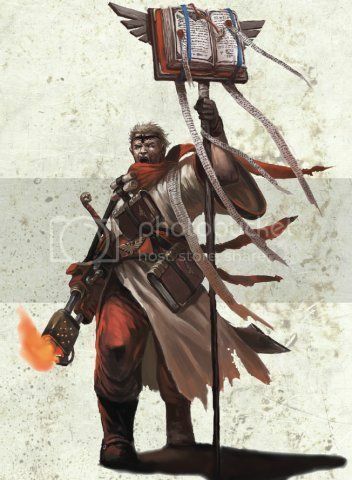 Will you be adding a Rosarius type thing? Or Heavy chains around his neck etc? 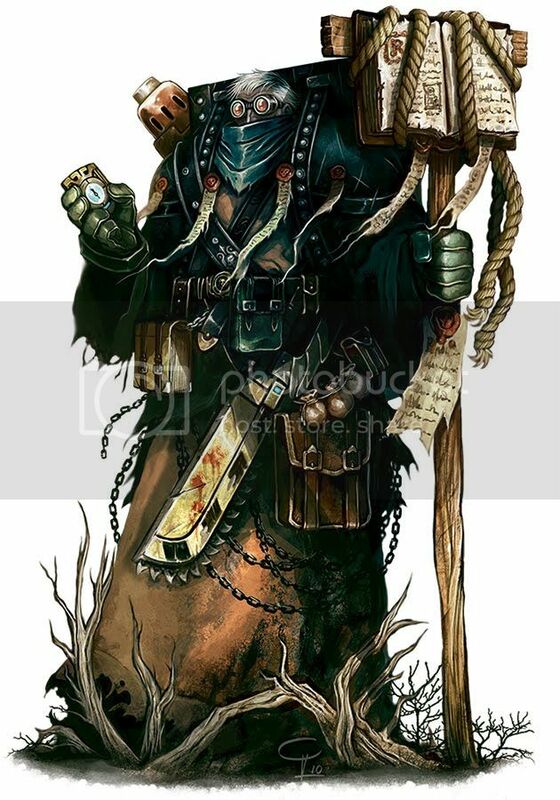 He still needs sandals, more pouches, some chains, purity seals etc. 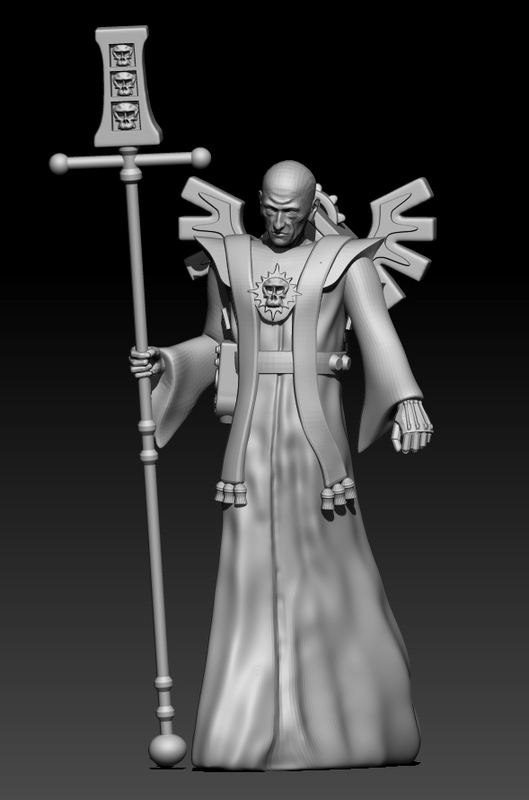 Now I need to do a cane in his left hand, add some digi rings to his right hand and some cables running from his belt devices to the shrine (which will serve as his life support system too). I may design a second head with a mask similar to that in the concept art too. The missionary looks very weather-beaten, and although you're thinking about sandals, I think bare feet suit him well. 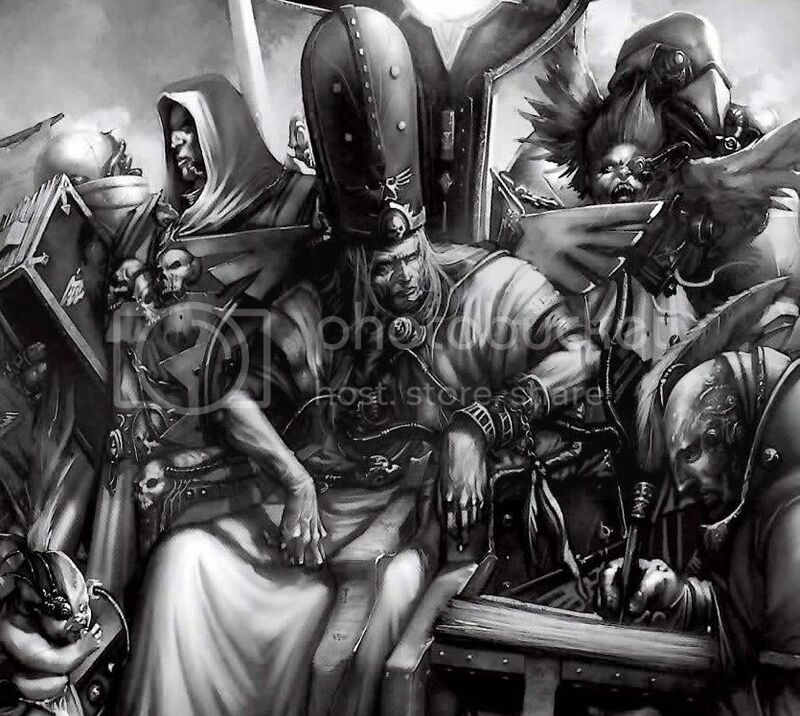 The cardinal's portable shrine looks like the beginnings of a jump pack - prayers from above!. 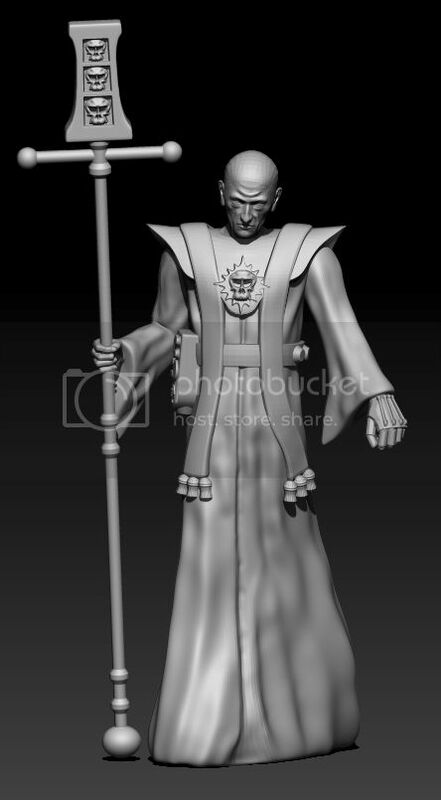 I'm not convinced by the ripples in his robe for some reason. Maybe if there was a toe and a heel poking out it might help to follow the line of the legs a little better?